Last year after being the Europe host for Menu for Hope bid items, I really gained an appreciation for how much work it takes to pull off something of such a global proportion. I’m so happy to take part again and offer you some great bid items! Menu for Hope is an annual fundraising campaign hosted by Chez Pim and a revolving group of food bloggers around the world. Five years ago, the devastating tsunami in Southeast Asia inspired her to find a way to help, and the very first Menu for Hope was born. The campaign has since become a yearly affair. For the past three years, Menu for Hope raised nearly a quarter of million dollars in support of the good work of the UN World Food Programme, helping to feed hungry people worldwide. Easy! Just buy as many $10 “tickets” for bid items offered by bloggers as you can, and 100% of the money goes directly to the WFP Purchase for Progress! Bidding takes place from today, December 14th until December 25th! A donation also makes a great present for someone, and they could win something! Here are the other Menu for Hope bid item lists – note that most of the items will ship worldwide, so visit all of them! Below are details about my own bid items and how to make a donation- read on! Bid Item EU01 : Made in Italy Chocolate Basket – ready for baking and a chocolate tasting party! For the past 3 years I’ve contributed a basket of Italian goodies but this year I thought I’d do something different – a basket of all Italian chocolate! 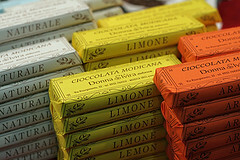 Italy has some great chocolate makers and especially some great flavor combinations I think you’ll all enjoy. In fact, I recommend having a chocolate tasting party at your house and getting creative in the kitchen with the basket. Some of the names are very famous and others are small chocolate makers – but you’ll love them all! I will ship this fabulous mix WORLDWIDE. That’s more than 2 kilos of chocolate – that’s 4.5 pounds of chocolate for tasting and baking! To bid for this item, make sure you remember the item code: EU01! Note: The photo above, graciously provided by David Lebovitz, is not indicative of the basket or its contents. I have gotten to know, professionally and personally, Moleskine (headquartered here in Milan) and I am proud to be able to offer you a bid item directly from Moleskine corporate! They will ship this amazing mix of 20 different types of Moleskine anywhere in the world. Thank you so much to Moleskine for donating these items! To bid for this item, make sure you use the code EU38! Here’s what you need to do – remember the numbers of my bid items! EU01 (Chocolate Basket) and EU38 (Moleskine Mega mix)!! Choose a bid item from Full List of Bid Items at Chez Pim, or the regional European list at David Lebovitz. Go to the donation site at Firstgiving and make a donation. Please specify which bid item you’d like in the ‘Personal Message’ section in the donation form when confirming your donation. You must write-in how many tickets per bid item, and please use the bid item code.Each $10 you donate will give you one raffle ticket toward a bid item of your choice. For example, a donation of $50 is 5 tickets and be divided into 2 tickets for EU01 and 3 tickets for EU38 – 2xEU01, 3xEU38. If your company matches your charity donation, please check the box and fill in the information so we could claim the corporate match. The last day for donations is December 25. Bid item winners will be announced on Chez Pim on January 18th. That’s one impressive list of chocolate bars! Grazie! I don’t know whether is more gorgeous your chocolate basket or the Moleskine box.